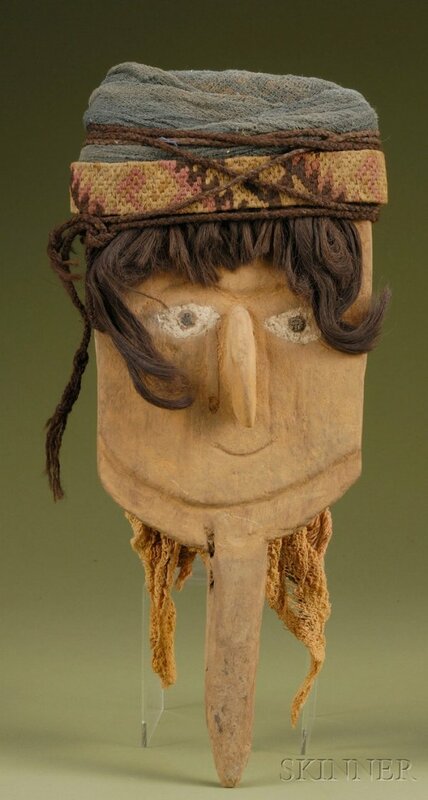 Below is another head from the Nazca culture (100 BC to 800 AD), with fine wavy red hair. 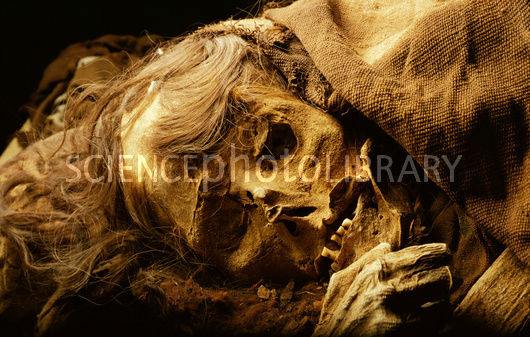 Next are photographs of a mummy bundle of a woman from the Wari culture (500–1000 AD), which was found in 2008 in a tomb at Huaca Pucllana, an adobe brick pyramid located in the middle of the modern city of Lima. 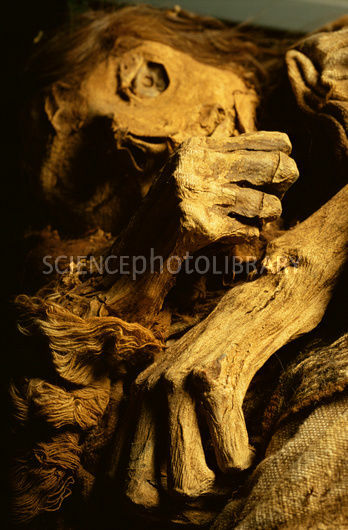 The mummy bundle was dated to around 700 AD. 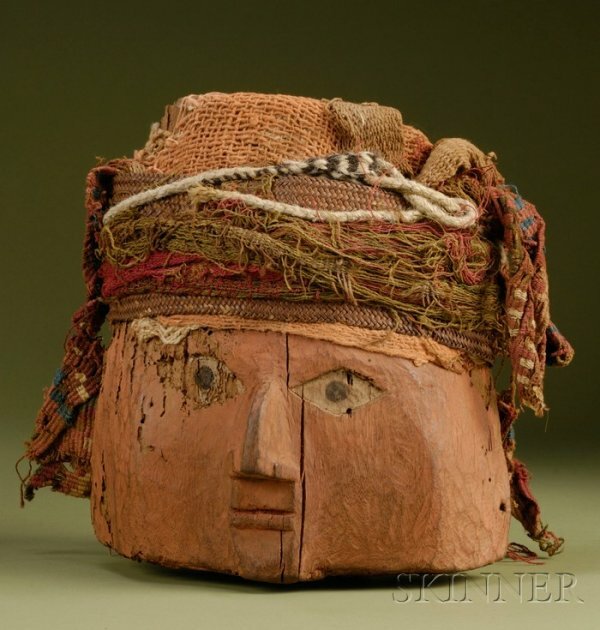 As the next two photographs show, the mummy bundle had a wooden mask with large blue eyes made of seashells. 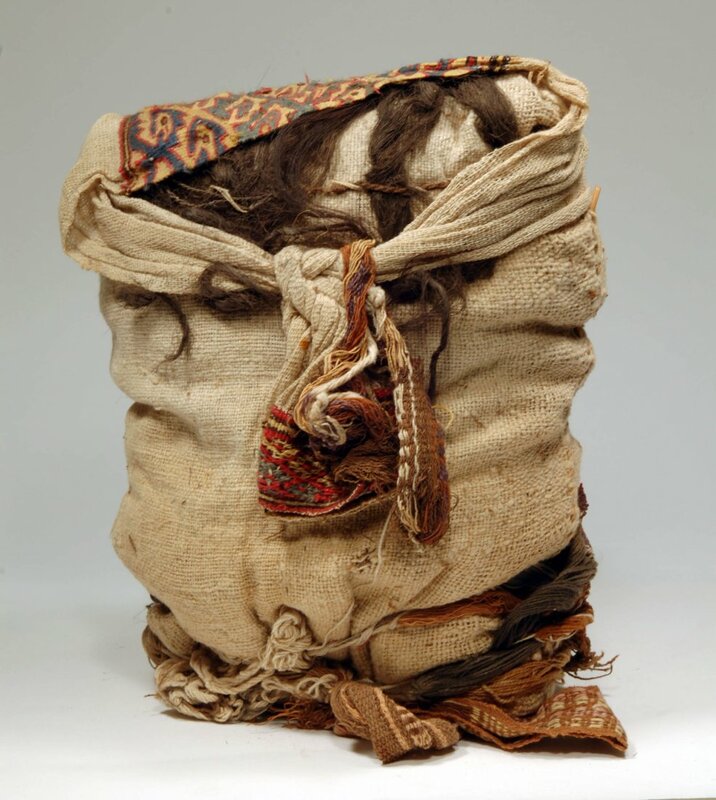 Below is a mummy bundle head from the Wari culture with fine wavy brown European human hair attached. 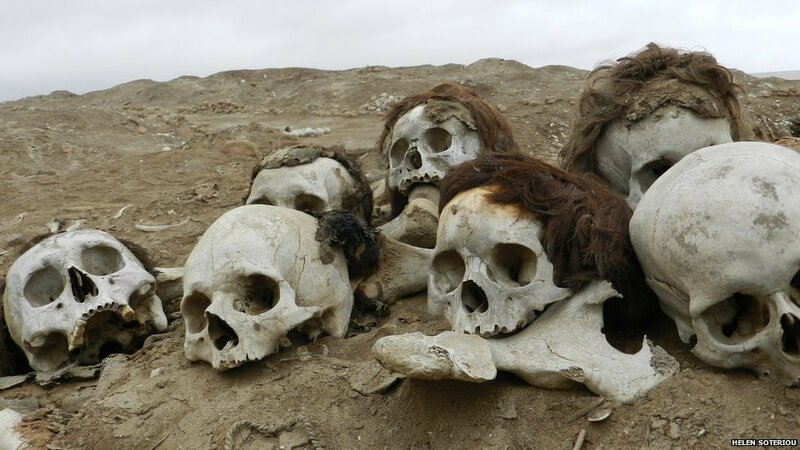 And next are skulls at Huaca Malena, a major cemetery of the Wari culture located about 100 kilometers (62 miles) south of Lima. 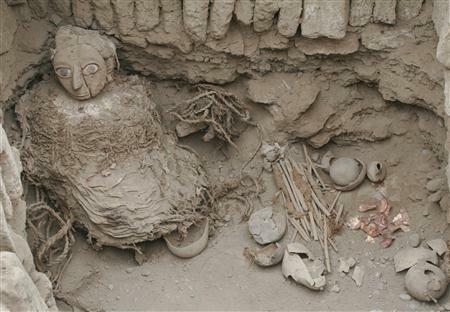 The thousands of Wari fabrics and tapestries found at Huaca Malena indicate that those buried there were of high rank. Some of the skulls still have their wavy red, brown, and dark blond European hair attached. 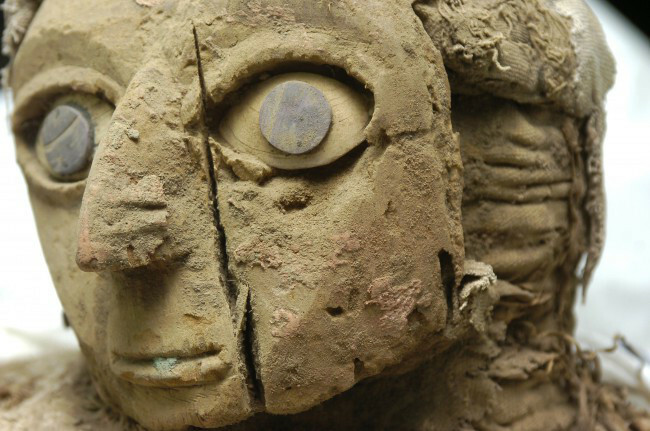 Below is a mummy bundle head from the Chancay culture, which existed along the central coast of Peru to the north of Lima from 1000 to 1470 AD. The face is painted a color exactly like that of European skin, and wavy brown human hair is attached to the top. 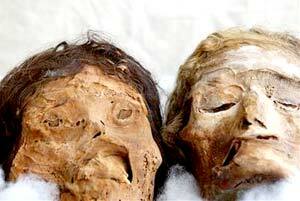 Below are three more artificial heads from the Chancay culture with European skin color. The second one also has wavy brown human hair attached. 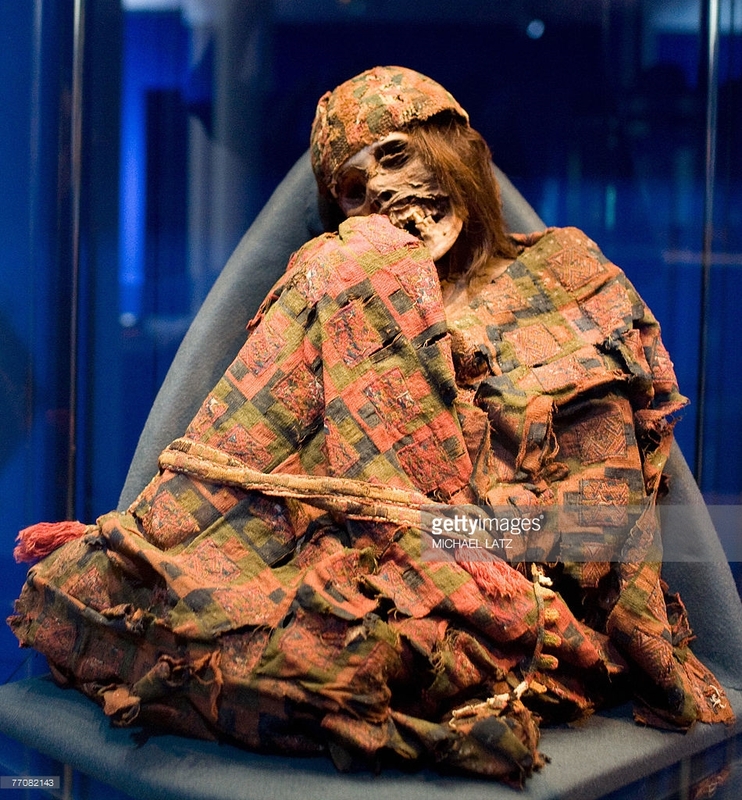 Next is the mummy of a child of the Chancay culture. The child was 4 to 6 years old, and it was dated to around 1334 AD. It has fine light brown hair. 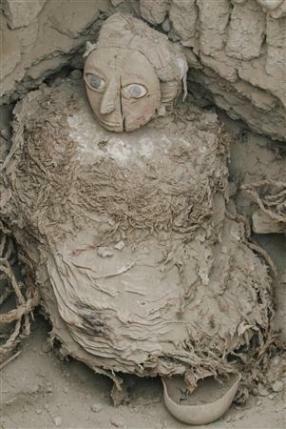 Below is the mummy of an elite male of the Chancay culture which was found in 2007 in the ancient city of Rontoy. He was is in his thirties when he died. 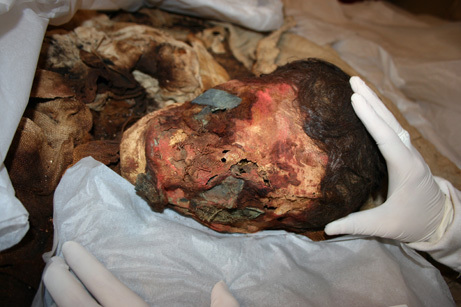 His face was covered in red paint made of mercury sulfide, and metal plates were placed over his eyes and in his mouth, but one can still see in the photograph that he had white skin and brown hair. An article and more photographs about this mummy can be found here and here, and a video showing the mummy being unwrapped can be found here. 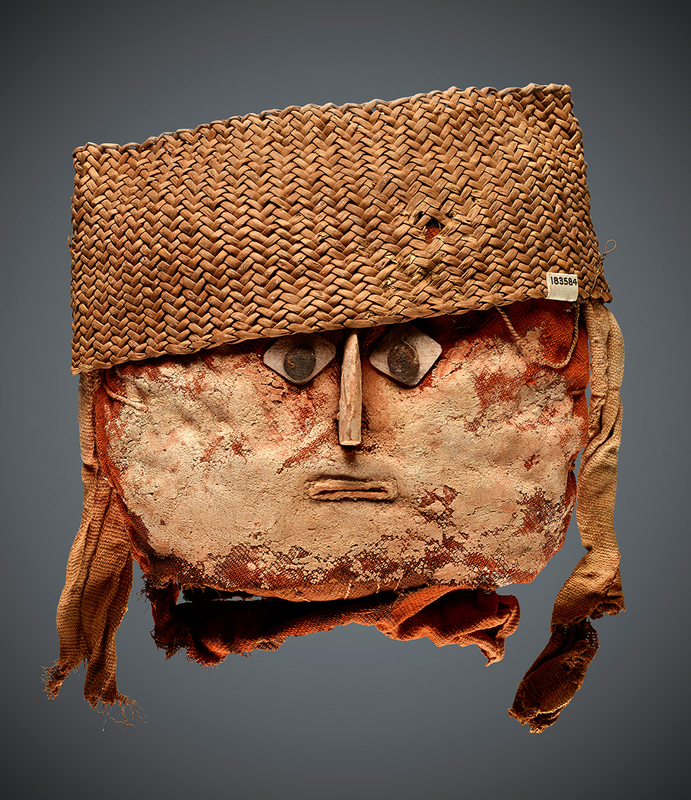 And below is a mummy bundle head dated to 1100 AD from the Huacho culture, which was located to the north of the Chancay culture along the central coast of Peru. The head has European skin color, European facial features, and brown human hair attached. 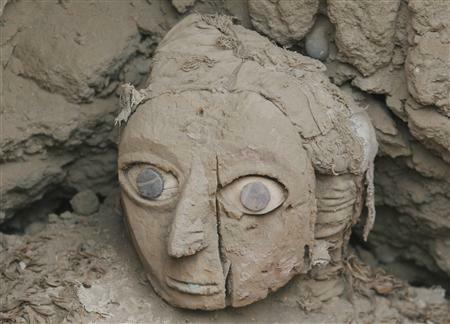 The next photograph shows two heads found at Pachacamac, a city of the Ychsma culture, which existed along the central coast of Peru to the south of Lima from around 1100 to 1440 AD. Both of the heads have white skin. The head on the left has brown hair. The head on the right has blond hair. 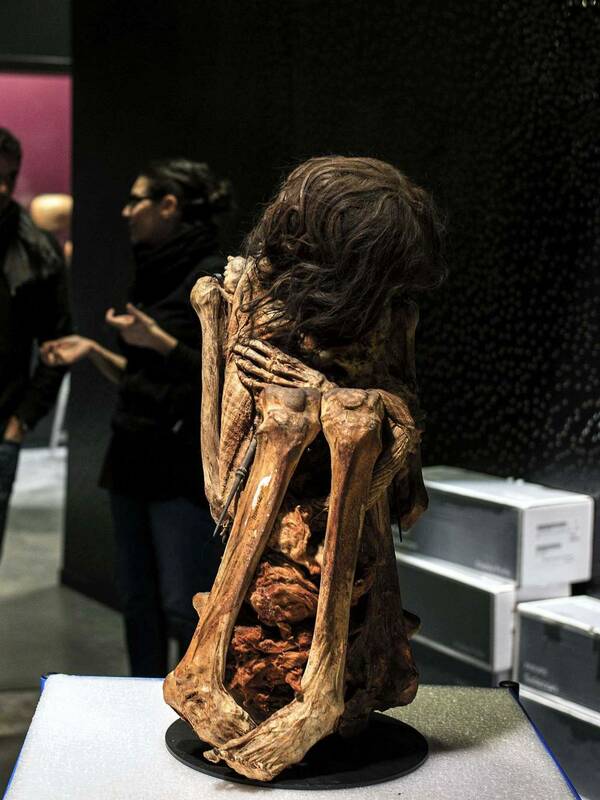 And next is a 1,000-year-old mummy of a Ychsma woman which was also found at Pachacamac, in 2012. She was around 50 years old when she died, and as the photograph shows, she had wavy brown hair. 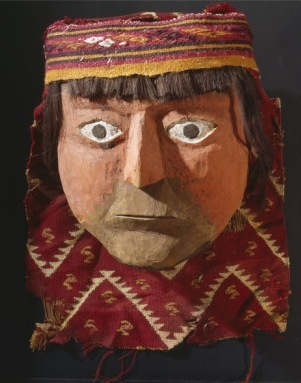 The word “Inca” is often used to refer to all of those who inhabited the Inca Empire (1438–1533 AD), but the word in Quechua means “ruler” or “lord”, and it originally referred only to the ruling class or the ruling family in the empire. The population of the empire has been estimated at between 4 and 37 million people, but there were only about 500 members of the Inca royal family when the Spanish arrived. 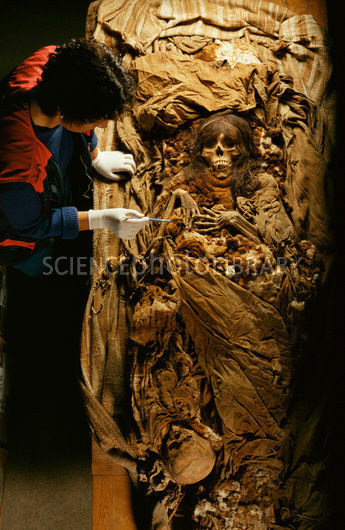 Below are photographs of an Inca mummy from Puruchuco-Huaquerones, a large Inca cemetery on the outskirts of Lima, which was first excavated in 1999. 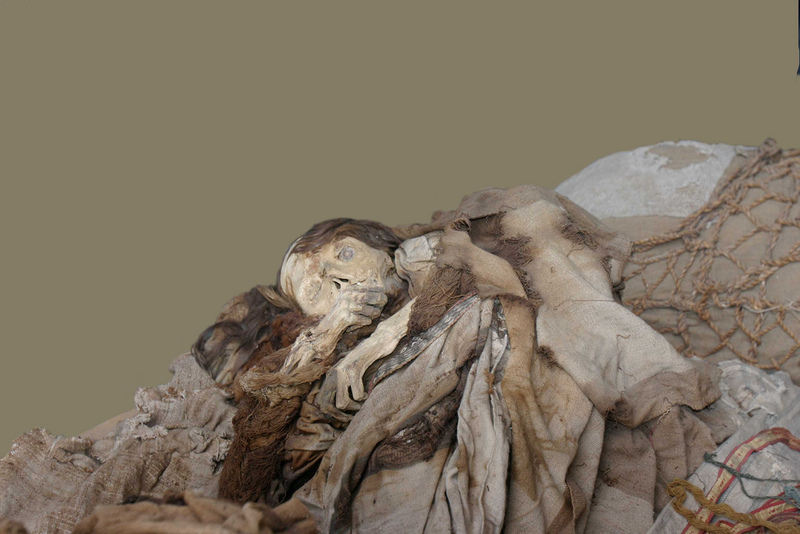 This mummy, nicknamed “La Señorita”, was buried with her child, shown in the lower left of the first photograph. The photographs show that she had white skin and wavy brown hair. 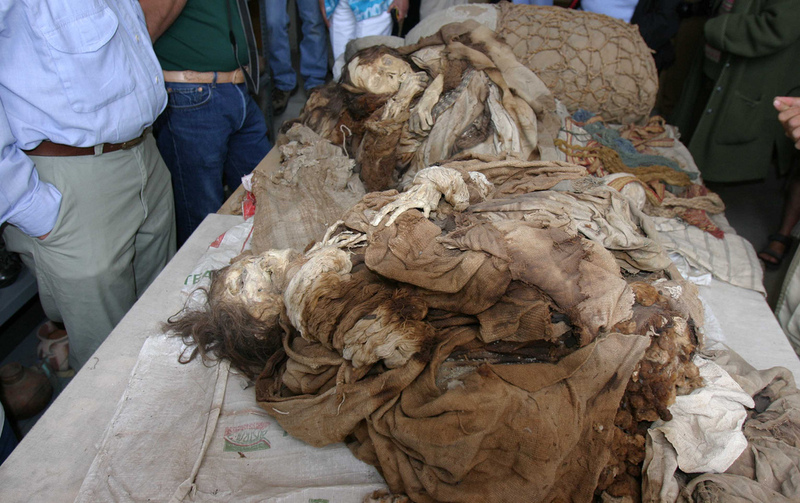 Next is another Inca mummy from Puruchuco-Huaquerones. He has white skin and fine wavy light brown hair. 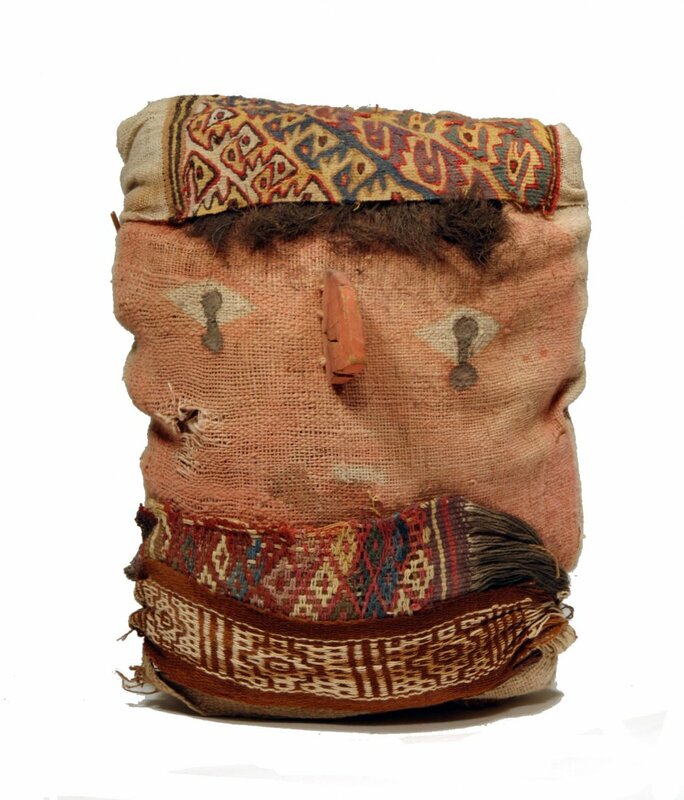 And next is a third Inca mummy from Puruchuco-Huaquerones. He also has white skin and brown hair. 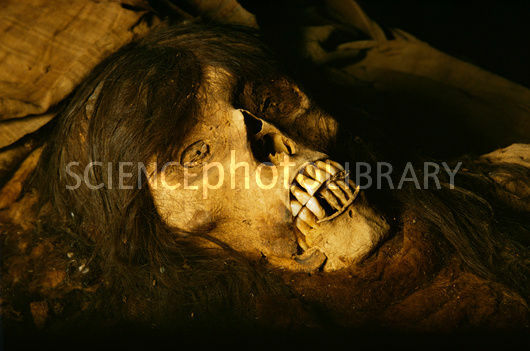 In the next photograph this third mummy is seen along with a fourth Inca mummy from Puruchuco-Huaquerones, which also has white skin and fine wavy brown hair. 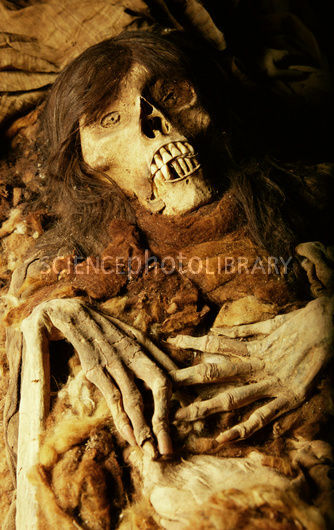 Below is the mummy of an Inca woman with red or reddish-brown hair. 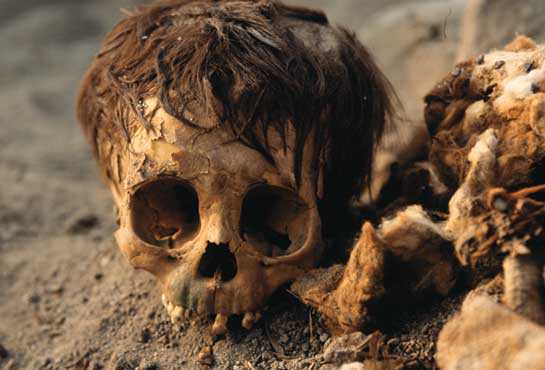 Next is the skull of an six-year-old Inca child at Puruchuco-Huaquerones, with its brown hair still intact. 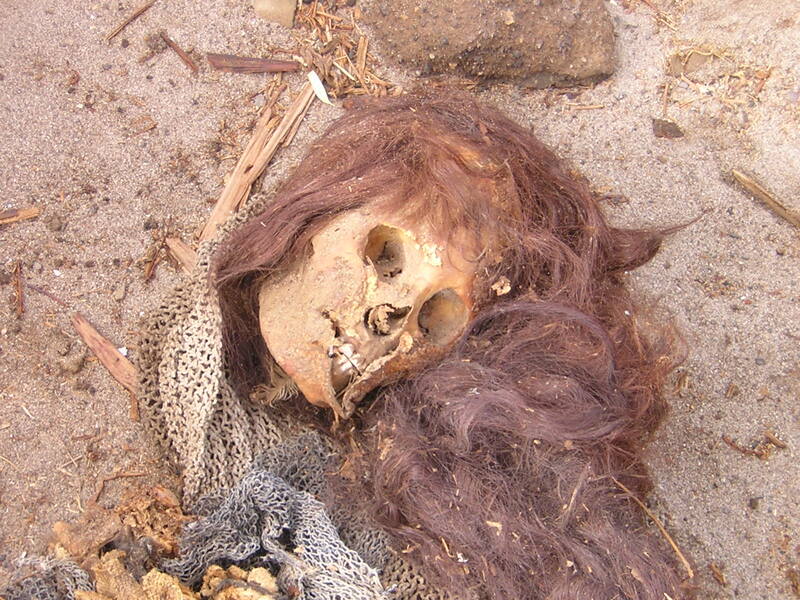 Below is a child’s skull with brown hair at the heavily looted site of Centinela, located on the central coast of Peru at the mouth of the Huaura River. 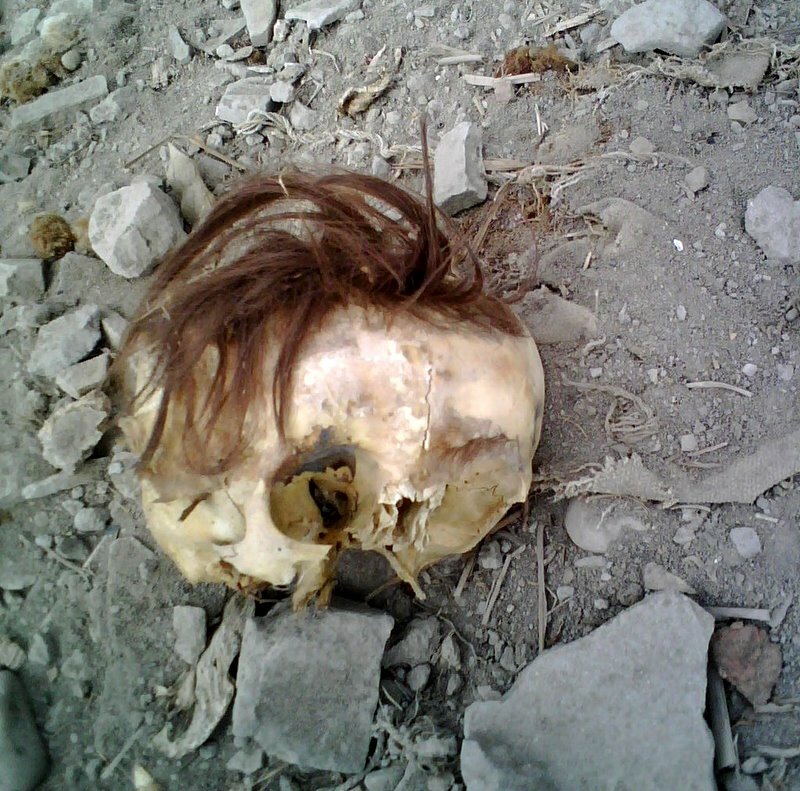 And below is a head at Caleta Vítor, a village not far to the south of Arica, Chile. 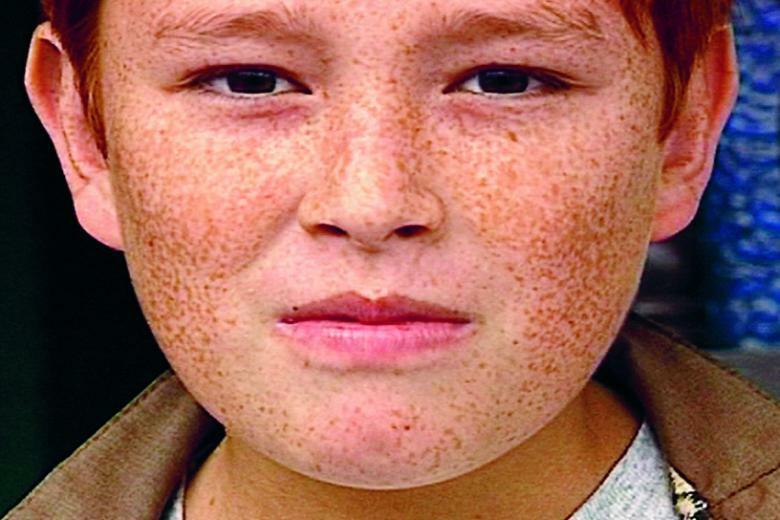 It has fine wavy red hair, white skin, and an obviously European female cranial morphology. 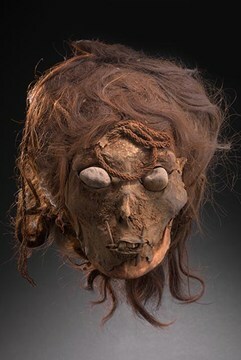 From the examination of a large number of mummies both from Egypt and other countries including South America, my opinion is that hair does not undergo any marked change post-mortem. The hair of a wavy or curly individual remains curly or wavy, and that of a straight-haired person remains straight. 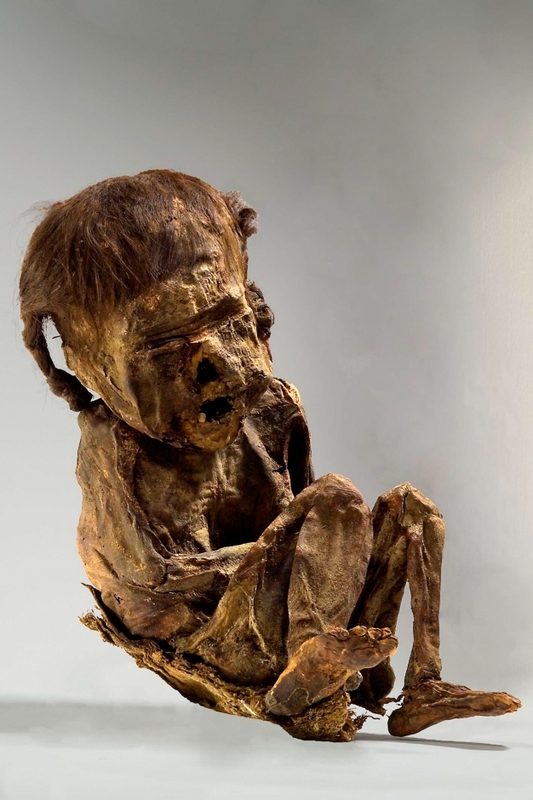 In mummies and desiccated bodies the hair has a tendency to be crisp and brittle, but this is the natural result of the drying-up of the sebaceous glands, which during life, feed fatty matter into the hair follicles which keeps the hair supple and flexible. … it seems to me very unlikely that any change in colour would take place in a body which had never been exposed to the light, … To sum up then, all the evidence I have indicates that the nature of hair does not alter after death except in becoming dry and brittle. 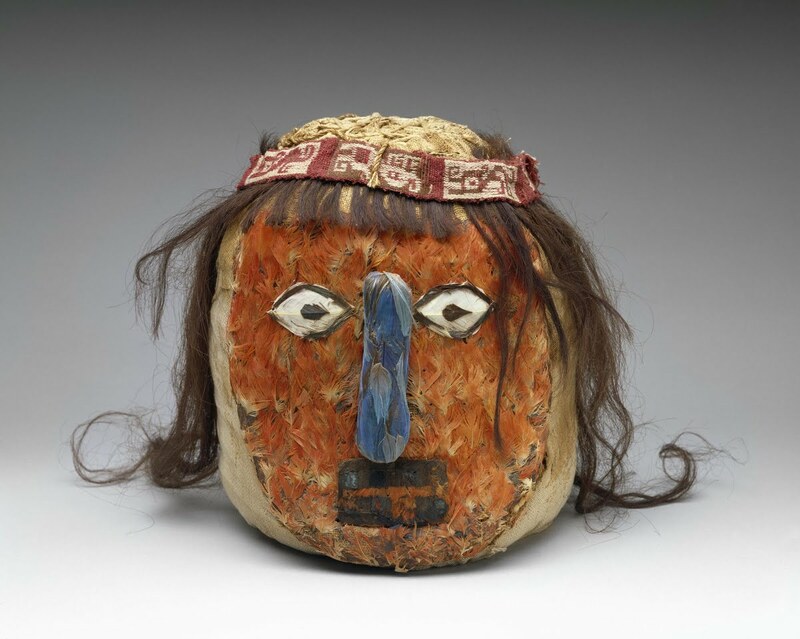 The ancient Peruvians appear, from numerous examples of hair found in their tombs, to have been an auburn-haired race. The hair has undergone little or no change, and differs essentially from that most characteristic feature of the Indian of the northern continent. It is brown in colour, and as fine in texture as the most delicate Anglo-Saxon hair. It is neatly braided and arranged, the front locks being formed each into a roll on the side of the head, while the hair behind is plaited into a triangular knot of six braids. The hair is shorter, and somewhat coarser, but fine when compared with that of the northern Indians. It is of a light brown colour, smooth, and neatly braided across the upper part of the forehead, then carried backward and secured on each side of the head. Woven of a peculiar pattern differing from all the others, and of an unusually fine texture: it was found, on being opened, to contain a small bead of malachite, the only one discovered in the tomb, and locks of human hair, each secured by a string tied with a peculiar knot. All the hair is of fine texture, of various shades, from fine light brown to black, and to all appearance has undergone no change. 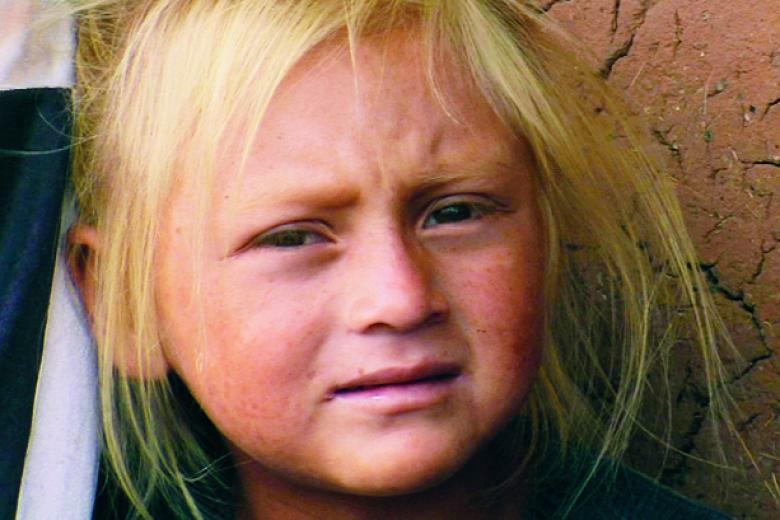 The colour and texture of the hair are facts of great importance to the ethnologist, as indicating essential differences from the modern Indians in one important respect; and therefore confirming the probability of equally important ethnic differences, suggested by other evidence. 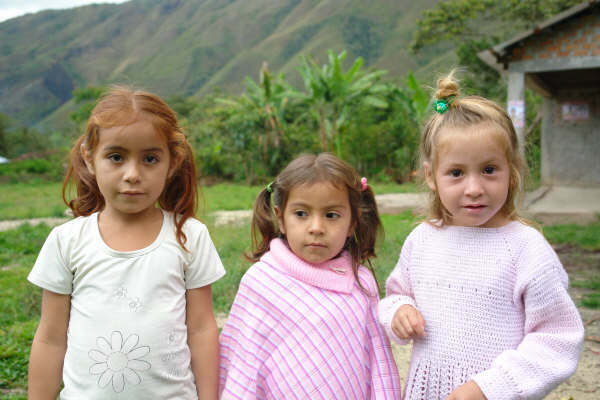 The “Gringuito” descendants of the Chachapoyas still preserve some of the genotype and phenotype of the White Gods of ancient Peru and Chile. 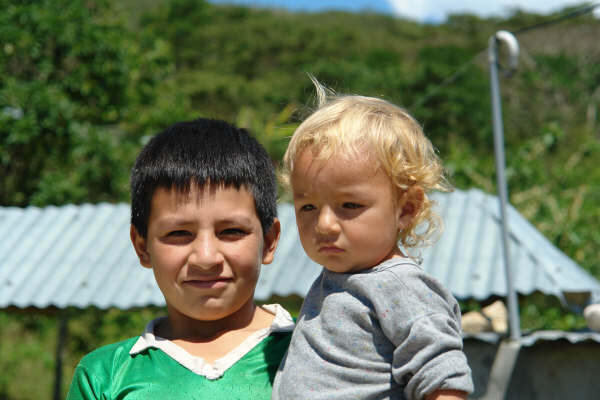 Their autosomal DNA is between 10% and 50% European, and some of them have Y chromosomes belonging to haplogroup R1b. 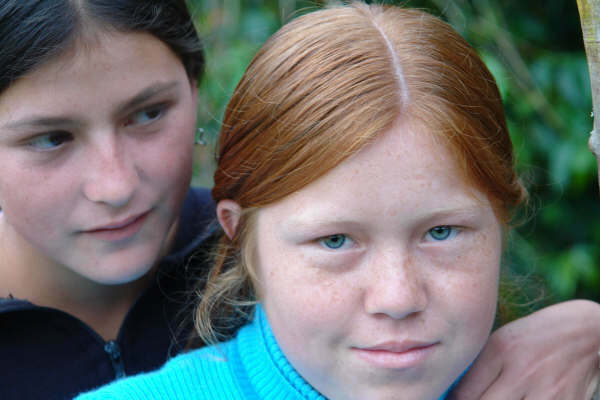 As the following photographs show, many of them have features like fair skin, blond and red hair, blue eyes, and freckles, which are typical of modern Northern Europeans, and not at all typical of modern Southern Europeans like Spaniards, who usually have brown eyes and brown or black hair. ‹ Was the Lord of Sipán White? Is there more information on the genetic testing on these remains beyond what this article is reporting, so “autosomal DNA is between 10% and 50% European”, what is the rest? And some Haplogroups “some of them have Y chromosomes belonging to haplogroup R1b”. Is there more or is this all that is made public? The genetic testing wasn’t done on the remains. 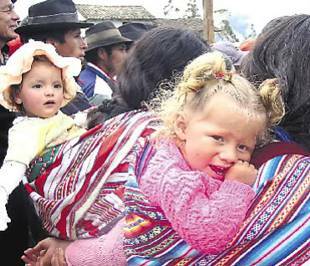 It was done on the living “Gringuito” descendants of the Chachapoyas. The testing is discussed in this documentary starting at 48:35. 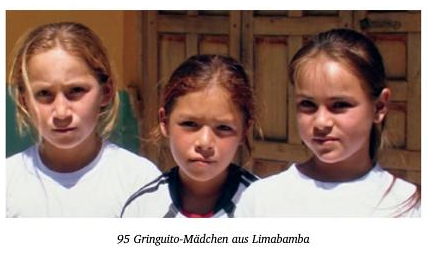 The rest of the “Gringuito” autosomal DNA is Amerindian. Don’t expect the fraudulent “scientific community” to ever provide true DNA results for the remains. There are also the videos here and here from 2014 in which others associated with Brien Foerster report that Paracas DNA was found to be Northern European. It’s unfortunate that we live in a world in which the only people who are in a position to test ancient Peruvian DNA are leftist, anti-White frauds like David Reich and Eske Willerslev, who are deliberately trying to cover up the truth, and hucksters like Brien Foerster and L. A. Marzulli, who may well be reporting the truth about the DNA, but who present the results in the context of ancient alien and Jewish fairy tale nonsense.